Projects like “Forms in Nature” don’t come around very often. Crafted with an unusual degree of care for getting the details right, the short film celebrates science and nature via geometrically constrained vignettes of animals, technology and natural phenomena. It’s the sort of film you can watch again and again, unearthing new layers of beauty with each viewing. In a very special case study for Motionographer, Chromosphere, the collective behind the project, and David Kamp, one of motion design’s most prolific sound designer/composers, shared all the details behind making the project. Kevin Dart The genesis of this idea is just a feeling of wonder that a lot of us remember from childhood visits to the science museum or from sitting in a classroom watching the space shuttle launch. We wanted to make something that would evoke those same kind of feelings when you watched it — a sense of awe and inspiration at the beauty of our world as well as mankind’s incredible scientific achievements. There was also an idea I was thinking about for a long time about how science and nature can’t really be separated from each other: science is all based on observations of things in nature. So if you just look at the world around you, you can see the science in action everywhere. Stéphane Coëdel It’s been a while that Kevin has been telling me about his intention to make a piece on science and nature that would contribute to educating the younger generation and stimulate their curiosity for understanding how the world around them works, and would bring back memories and feelings that the older generation might have had growing up in an era of scientific innovation. Watching programs on TV that were using an artist’s vision to support their educational speech. Being myself a science fan, it was pretty easy to jump on board. I’m pretty nostalgic of this era when TV networks were really excited and adventurous in promoting science shows. Some of them had very strong visual openings paired with very specific sounds and music. They had a real impact on my imagination as a kid. These made me feel like science was the key to the future, and allowed my speculative mind to go wild. That’s what we tried to recreate with our film. KD It was really hard to figure out where to start, because it’s such a huge topic with so much material and possible routes to take. We were initially more focused on the space exploration aspect, but it didn’t seem to quite capture the complete picture of what we wanted to represent. At the end of 2014, I was starting to work on ideas for an art show and wanted to approach the idea of science and its relation to nature again. The first thing I did was gather lots of inspirational materials — especially images of old science books and pamphlets — anything that evoked an aspirational view of science. A lot of these use bright colors and graphic shapes that would help inspire the visual style I decided to use for the film. KD The scale of it was really daunting, so to pare down the concept, I started researching and writing a list of some of the most momentous scientific discoveries and innovations throughout history. Once I had come up with a pretty diverse spectrum of topics, I then began to figure out images to go along with them. KD Initially, I had imagined doing just a few circle-based images, but as I kept drawing, I realized there were a whole lot of things that could work within the circle composition. I also liked that symbolically the circle shape tied back into the theme of connectivity between science and nature. So I started sketching tons of them. I actually wanted to do all “half images” that would make a complete circle when they were next to each other, but it was really difficult to find compositions that read easily when they were cut in half. KD Eventually, I moved away from the split screen images and started coming up with full compositions because they were easier to read (although we did keep the split screen idea for some of the transitions in the final film). I just made a little template and drew as many things as I could think of. It was really important to me for every image to represent something positive about science, such as Darwin’s finches, Jane Goodall’s discovery of tool use among chimps, complex animal societies, or various milestones of space exploration — and also images relating to eco-conservation. Rough thumbnails for the color script. KD The next step was to choose the best ones and create a final color script. KD We knew from the beginning that this was leading to some type of animation, but it wasn’t clear what shape that animation would take. At first, I wanted the animated scenes to play in a random sequence in some kind of interactive exhibit. I talked to sound designer and composer David Kamp about the possibility of doing a modular score that could match up to any randomly cued animations in an infinite loop. But to keep things simple, we settled on the idea of doing a 2-minute score with 4-second intervals (David’s suggestion) that we could time the scenes to. It was a little scary not having a storyboard or any real plan to guide the finished film, but I had a good feeling that David’s score would provide the structure we needed. SC We thought that sound would be key to triggering the feelings we wanted. So we decided very early on that David’s piece would be the canvas we’d build our piece on. David contacted me about 6 years ago, after we released our first Yuki 7 short, saying that it would be great to collaborate on some future projects. But somehow we never got the opportunity to do so. Since then, David kept being involved in amazingly cool projects, and I’m a big fan of his work. When Kevin mentioned his name, it was a no-brainer to me. David Kamp When Kevin came to me with this project, it was immediately clear I wanted to be involved — not only because I remembered our previous collaborations as fun, but also since I love the style of illustration and can personally relate to the subject and message. That, combined with the level of attention to detail, present even in the earlier illustrations I saw made want to be part of this. Later, seeing the animations come to life shot by shot with an equal amount of detail and love by Stephane and Nelson was amazing. SC Kevin and I had few different references about music and sounds. We both wanted some synthetic vibe. Kevin’s main reference was the Bill Conti opening score for the movie “The Right Stuff”. Mine was the early work of Jean-Michel Jarre, especially his album “Oxigene”. The Moog instrument was something I wanted to refer to since back in the 70s, it was often associated with science or science fiction. The rest was all up to David. DK Regarding my process for the music: As with most projects I work on, I followed my gut feeling to figure out the right type of soundscape for this one, spring-boarding off the original music suggestions they had supplied. I steered away from some of the initial refs a bit, as they felt a bit over the top, but stuck with the synth heavy approach. I knew early on, that I wanted the music to be very harmonically structured and pattern based, sort of mimicking the visual style of the illustrations — as opposed to a more ambient approach which would have been an option as well, looking at the calm and static landscape shots throughout the piece. The tool of choice to create these musical patterns and structures were many overlapping arpeggiators* creating evolving overlapping patterns with the roughly ten instrument voices they were triggering. Arpeggiators also happened to be a popular tool in 70s and 80s synth music, so it made sense stylistically as well with the 80s/70s synth sound palette I was using. While using all those overlapping patterns, I had to make sure the musical accents at edit points and major animation actions remained very pronounced (underlining the “seconds grid” of the edit and animation structure we came up with at the beginning) so that made me add a rhythmically very simple “theme” on top of the whole thing to help mark some visual key points. Here is a montage of some of the sketches for the music, ending with the final version. DK Once all shots were in their final visual stage, the last step was adding sound effects. There are moments where the music sort of takes the function of sound effects (like the melody in the shot of the birds nest) but for most other shots, I stayed away from “Mickey Mousing” too much. The purpose of the the sound effects was to give some more depth and immersion and an occasional detail to some shots without distracting from the already very dense music mix. As a result, there are some shots that have no sound effects at all — music was supposed to take a clear lead on this film. So I made a conscious effort to only add sound effects where they really added something new to the shot, while trying to keep them very simple and clear. This meant using mostly “non-structured” sound effects, like a continuous gas/ventilation hiss for the Large Hadron Collider (1:20), or some low drone for the underwater shots that would not interfere with the rhythms and patterns the music was doing. I also adjusted the pitches of some of the sound effects, so the inherent harmonies of some of the sound effects would match those of the music — in an effort to make the sound effects less of a distraction from the music by “sticking out” harmonically. The more realistic source sound effects stem for the most part from various sound effects and ambience recording sessions I made last year. For another project, I had access to some non-public municipal facilities, where I recorded the hissing and resonating sounds of a gas station, for example. These recordings were used in the Large Hadron Collider shot in the film. DK The bee shot in the film uses sounds I recorded at a beehive last year. Hint: Having your headphones within a beekeepers suit and hearing the sound of 10,000 bees in full stereo buzzing around the microphones while recording turns your brain into panic mode. There was a lot of hysteric waving at non-existent bees. In theory, I knew the bees were at the entrance of the beehive where the mics were and not within the suit and right at/in my ears — which is what it sounded like through the headphones. It took me a while and some serious zen tactics to be able to stand there without constant waving and jumping around. KD When it came to creating the final paintings, I first created a grid template that I would use as the basis for every illustration. It’s broken up into 64 squares wide x 32 squares tall with a circle in the center that’s 16 squares in diameter. I also created a file filled with circles of different diameters — 2, 4, 8, 16, etc. — that I could just drop into my paintings to create any circle shapes I needed. These templates really helped streamline the process and keep a certain visual consistency, as well as add a cool, slightly mathematical vibe to everything! Every shape and detail in the illustrations is aligned to the same grid. KD Pretty much as soon as I had finished the first few paintings, I handed them off to Stef and Nelson Boles to begin animating. SC I started alone animating all the scenes, but it became clear at some point that the task might be too big for just one guy. So we asked Nelson if he’d be willing to help with character animation. He came on board early November. I would find references on Youtube for each animal that Nelson would animate and send him the portion of footage that was relevant to the action. SC We decided the action would be based on a 1 second pace. So each key action would happen at every one or two seconds, to make it easy to edit in sync with the music. Nelson Boles Kevin hit me up about doing animation, and the shots Stef had already done were amazing, so I couldn’t pass it up. Everything was stemming from a real appreciation of how nature looks and moves, and I think that authenticity is sometimes neglected or streamlined in order to fit a narrative. So it was really fun to just bring these little moments to life without any baggage. Just things existing, unaware of us or the camera, letting you soak in a little moment somewhere on Earth (or nearby). Stephane had all these great reference vids of animals doing very characteristic things. I felt my work was already done for me! The main challenge for me was translating this realism into the graphic rules Kevin set up, creating additional poses/angles that complimented the design but still felt seamless and natural when they moved. NB TLDR: I took Kevin’s PSD, imported that into an FLA as a PNG, created an SWF that Stephane put into an AEP which he probably then exported as a MOV. KD Once the character animation was in place, every scene would go through Stef’s incredibly artistic and detail-oriented compositing process. After working together for so many years, I have a good idea of what Stef will need in my PSDs, so I build each scene up in such a way that every single element will be possible for him to tweak and animate. SC In my work, I very often fake 3D by using 2D tricks like parallax and re-constructed Z-depth to bring depth of field in the scene. I use Kevin’s PSD files that are layered to optimize the animation. Almost everything meant to be animated has its own layer and is properly named. I often have to re-build some graphics in After Effects using the shape tool, so the animation process gets more flexible. I usually start by deciding in my head what I want the action and the camera move to be, and visualize effects and the lighting before I start animating. It’s not a rigid process. Sometimes I just have a vague idea where I’m going when I start. And I let my instinct lead me, keeping in mind that the final look must be faithful to the artist’s original design while bringing it to another level of depth and reality. My goal is always to expand people’s perception. I want them to feel like we’re showing them a portion of something much bigger. What role did the Foundation for Science and Nature play in this? Were they “clients” in the traditional sense? KD It is a made up organization. I came up with that and the National Science Programme to try and make the film look more authentic. It’s meant to evoke the feeling of vintage educational films, and what educational film would be complete without some sort of government sponsorship? Charley Harper, I’m guessing, was a big influence here. Is that correct? Who else and why? KD Charley Harper has been huge influence for most of my professional career. One of my biggest takeaways from studying him and other artists like Ed Emberley is that graphic design occurs naturally everywhere in the wild. That’s why a big part of my process involves obsessive research, and I have folders of reference photos for every single illustration in the film. I’m always hunting for those beautiful natural shapes and details that make our world so interesting to look at. 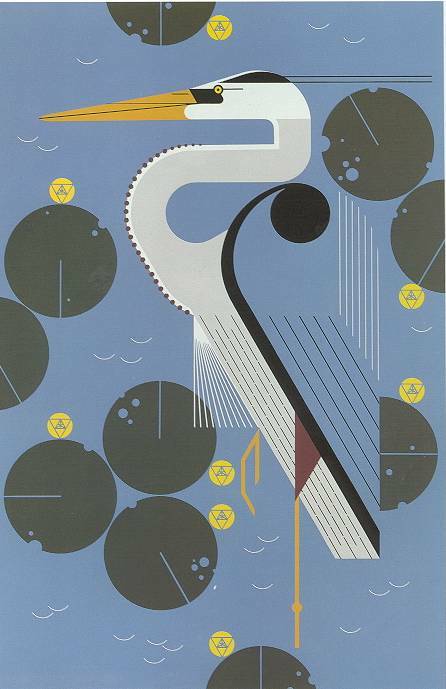 Charley Harper was a master at spotting those shapes and drawing them in his elegant graphic style. It was really important to not make anything up for this film, because the whole point was to celebrate the natural beauty of our world and some of mankind’s incredible scientific inventions. So yes, some of the visual philosophy is most definitely inspired by Charley Harper, as well as some of my other favorite designers like Tom Oreb, Eyvind Earle, and Maurice Noble to name a few. I also took huge cues from Kubrick for the cinematography. The lighting and camera movements are sort of a style that Stephane and I have been developing together for years and is influenced by so many artists and filmmakers that it would be impossible to name every one. Do you have a favorite sequence or moment? If so, which one and why? KD My favorite moment is the scene with the Great White. I’m so happy with the music and animation on that scene, and I’m also just really passionate about sharks and shark conservation. SC I have many but think the Shark/Snail moment is the strongest to me, mostly because of the music. At that moment David’s music brings us to a higher level of depth. There a sense of mystery and adventure that bursts out during these two scenes that gives me the chill. How long did you work on the project? KD I started working on really early ideas at the end of 2014, but didn’t start on the final color script until August 2015. Then I started on the final paintings in September. SC I started animating the first scenes end of October 2015. The first I did was the Apollo lunar module. And I finished the last one on February 10. It was the frog eggs. Did your work on “Cosmos: A Spacetime Odyssey” inform or influence this project in any way? KD Yes, working on Cosmos really hit home the importance of doing research. I’m used to doing research for visual details, but I knew for this that I would also need to spend time researching the concepts and ideas. It was also really motivating to be part of such a large scale effort to inspire young people and the experience made me want to do more of that. It seems like science is on an upswing in mainstream media again. It’s making headlines and challenging long-held beliefs in a way that it hasn’t since the mid-20th century, when scientific optimism abounded. Do you agree? KD Yes. I feel like in some ways there is still a strong anti-science climate in many corners of our culture, but overall it seems like we are on the cusp of a new age of scientific optimism. Every week, there seems to be something incredible happening, whether it’s SpaceX landing a reusable rocket, the New Horizons mission, or new insights into our biology. I think the Internet is helping in a lot of ways to fuel the quick sharing of ideas so in general people are more aware and informed of everything happening in our world and in the fields of science. Things don’t seem as far away as they used to, and I am really optimistic about the continued growing presence of science in all of our lives. What would be your dream outcome for this project? SC I feel like we’re reaching a key moment in our scientific history where everything is accelerating. The new discoveries happen at a faster and regular pace. I hope our piece is contributing to feeding this global enthusiasm for research and science that I feel is surging lately. We’d love to be more involved in this wave and collaborate with real scientific partners. Absolutely brilliant. Thanks so much for sharing this super in-depth process! It’s amazing to see how much thought & research was dedicated to the concept. This will likely be the best piece of 2016! Definitely a piece worthy of a behind the scenes look. Hope to see more of these in depth posts! I hope to high five these talented peeps someday. This stuff is so good. This read has opened my mind in a way I have not experienced in quite sometime. Absolutely incredible piece. Thank you for sharing this. Gah! This is amazing Justin! I think I’ve read this post every day this week. So inspiring and so much detail and process juicyness! O • • • • M • • • • G • • • • !!! Fascinating project and very nice and complete article! Congrats and thanks a lot! This was incredible! I work in Motion graphics aswell, and seeing something this beautiful really inspires. I actually read through mainly looking for the time it took you, as one of the most annoying things about the industry, is wanting to do work this amazing and inspiring, but clients asking for work like this with 1-2 month deadlines, start to finish. I like these breakdown link in videos, because I hope clients read them, and see how long amazing work takes. Guys, this is simply astonishing, thanks for inspiring me, this is one of the best piece I’ve ever seen.